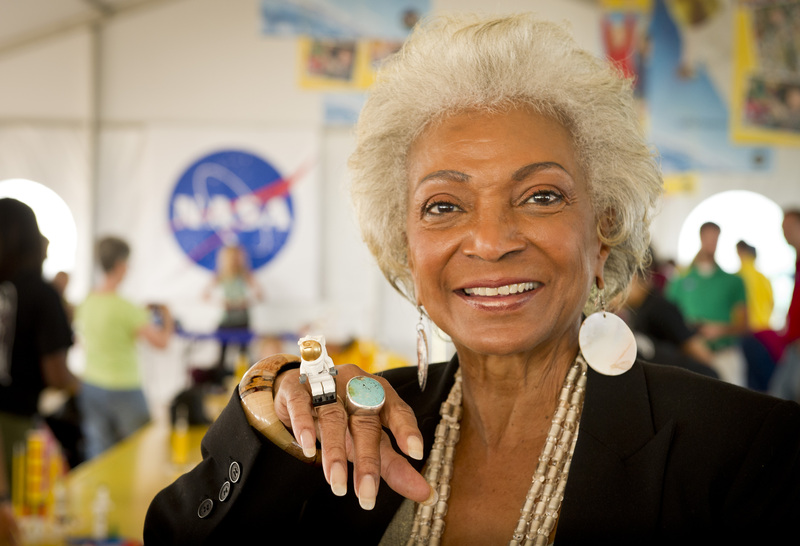 On this day in 1932, the world welcomed a woman that would leave her mark on not just science fiction, but history itself … none other than Nichelle Nichols! Still going strong at a vivacious 86 years old today, most everyone knows Nichols as Lt. Uhura from the original Star Trek series and the movies spun off from the broadcast run. Thought of by many as the First Lady of Science Fiction, as Uhura, Nichols broke barriers as not only one half of the first interracial kiss on broadcast television, but as the first person of color to portray a leading role on TV in a role that was not delegated to servant or slave. So great was her impact, civil rights leader Martin Luther King, Jr. personally commended her work, and offered her guidance when she considered leaving the show. By encouraging her to continue, he helped cement her legacy as a pioneer in the entertainment industry. President Obama and Nichelle Nichols flash the Vulcan greeting. While well known for her work in the Star Trek franchise, Nichols is also an accomplished singer, dancer, and has done work with NASA in the past to aid in recruiting more minorities and women into the fields of space travel and aeronautics. In addition, she has left a brand on science fiction all her own as an author beyond penning her memoirs: in 1995, she released her first fictional novel, Saturn’s Child, a love story set in a beautifully constructed future world with some elegant nods to her Star Trek roots. The novel was followed by a 2005 sequel, Saturna’s Quest, and according to murmurings will finish off as a trilogy in the future. We here at Krypton Radio wish Nichelle many happy returns of the day. We understand her health has been faltering as of late, and like the rest of fandom, we are concerned for her continued well-being. For now, though, she is still with us, and still a beacon of light and warmth to all of science fiction fandom.